Welcome to the SurveyMaker product mini site! Improve audience interaction and engagement! Improve the "look and feel" of any Adobe Connect "virtual room"
SurveyMaker ENTERPRISE EDITION - released 16th May 2014! SurveyMaker for Adobe Connect is an essential tool that deepens, enhances and streamlines the process of collecting data from participants. SurveyMaker has been designed to overcome the limitations of Adobe Connect's standard polls. It is more space efficient, adds 7 new question types, allows detailed live analysis of collected results, creates instant custom PDF reports and allows you to save and re-use your surveys in any Adobe Connect room. With 11 question types that we know you want to use, including horizontal and vertical sliders, rank, free-text, multiple choice, number, Likert Scale and multiple answer. Questions scale dynamically to make best use of the space available on each participant's screen. 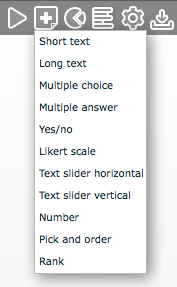 Your surveys will always be easy to read, even at narrow pod widths. Create complete client-ready PDF reports with all data present and chart colours that match your branding instantly from within the app. Control the colour scheme of your questions to suit your needs. You can direct attention, manage emphasis or highlight required questions. Save your surveys to the cloud so they can be reused in any Connect Room on any server you need them. Save survey templates and data sets quickly, easily and reliably into your ActiveC cloud account for access anywhere and anyplace. Export all the data directly from the app in a convenient CSV file ready to work with offline instantly. With built in safeguards to ensure data can not be manipulated or accidentally wiped, you can trust SurveyMaker to always tell the truth. We've made live data analysis simple and beautiful. Get powerful live feedback from your live surveys and share them with participants at the click of a button. Customise the colour of your charts to make them easier to understand or match your branding. Screen real estate is always at a premium, but with SurveyMaker you can group multiple questions together in just one pod. Create or review your surveys from anywhere with SurveyMaker running standalone in a browser then import everything into Connect using your ActiveC cloud account. or get in touch and we'll keep you informed!